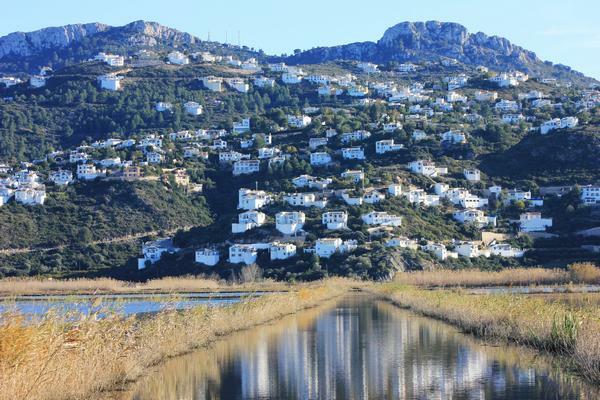 Pego Marsh is situated in the far north of the Costa Blanca with some of it’s boundary in the adjacent Costa Azahar. 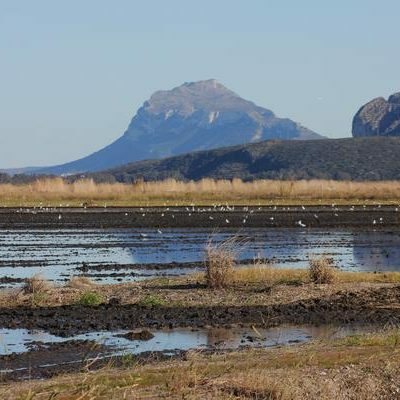 This extensive wetland is framed by the Segária & Mustalla Mountains, and kept irrigated from subterranean springs (ullals) and the Rios Gallinera & Molinell. Extensive rice cultivation ensures this remains the case even during Summer making it a haven for breeding wetland species. 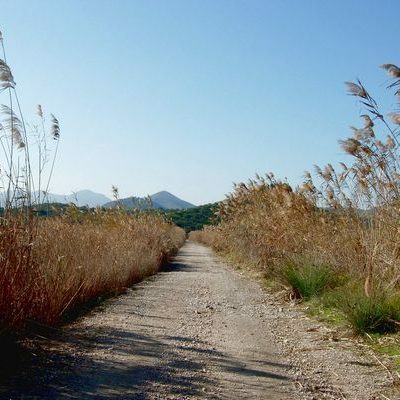 Pego Marsh covers an area of about 6 Km 2 stretching south from Oliva to El Vergel Safari Park with two main habitats the reedbeds & the paddy fields, with smaller amounts of allotment, orange grove and hillside sierra around its edges, It is currently going through period of change with a certain amount of investment being given to this natural park that has brought a site warden & assistant, better signage, and a purpose built lagoon with a walkway, observation tower and small hide. 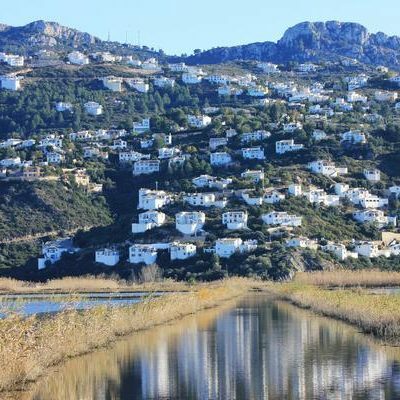 The CV678 minor road runs directly through the centre of the marsh from the main N332 inland to the town of Pego and from this road it is possible to access most areas of Pego Marsh. Metalled tracks run both north & south of the CV678 with the first ones just after the road passes over the AP7/E15 motorway, and others as the paddy fields start about 500m further on. Unrestricted access is possible along all these tracks although during the hunting season (mid-October – February) they can be closed off particularly at weekends when the shooting takes place. Driving (slowly), walking, or cycling these tracks will produce many species of bird at all times of year with an abundance of Herons, Egrets, ducks, and waders to look through. 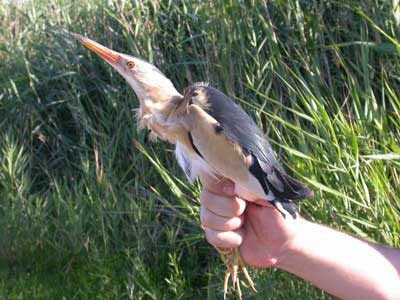 Reed and wetland species dominate the birdlife found on Oliva/Pego Marsh with hundreds of herons, egrets, ducks, waders and reedbed dwelling warblers to be found almost all year round. During Summer the paddy fields remain irrigated thus making them very popular with breeding water birds, which include Little and Cattle Egrets, Grey, Purple and Squacco Herons, Little Bittern, Mallard, Red Crested Pochard, Coot, Purple Swamphen, Moorhen, Black winged Stilts and Little Ringed Plovers. There is a very small population of breeding Marbled Duck and recently Collared Pratincole raised a few young for the first time and will hopefully continue to thrive. 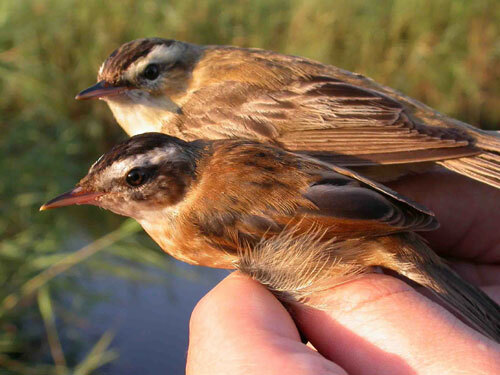 Other breeding species include Whiskered Terns, Iberian Yellow Wagtails, Woodchat Shrike, Great Reed, Eurasian Reed, Savi’s and Cetti’s Warblers plus a species that is rapidly declining over much of Spain the Moustached Warbler. In fact a survey completed in 2006 showed that this site was one of the best places to find this rare and elusive Acrocephalus in the Communitat Valenciana and probably mainland Spain. Winter sees a new set of species arriving at the marsh and among the good numbers of Chiffchaffs, Chaffinch, Reed Bunting, House Sparrows, and Meadow Pipits, there is usually the odd Water Pipit and Bluethroat strutting through the damp fields. In very cold Winters even more finches can be found, which can also include a few Brambling, Tree Sparrows or even Hawfinch. These flocks of birds also attract their share of raptors with Marsh Harrier, Common Buzzard and Kestrel being fairly common, but also Booted Eagle, Hen Harrier, Sparrowhawk, Peregrine and Merlin. Although there is still hunting around the marsh it still manages to maintain a fair number of waders with Lapwing, Common Snipe, and Green Sandpiper being the most abundant. Like most good birdwatching sites it is at passage periods when things can get very interesting with the flocks of migrating birds moving up or down the coastline depending on the time of year. During March and April it is not unusual to find large flocks of ‘flava’ Wagtails of various races in the fields, along with chats, pipits, larks, flycatchers & warblers. Swift, Swallow & martin numbers can be spectacular as they move through in Spring with a possibility of all the commoner European species flying around together, this then attracts the attention of a migrating Hobby or even better an Eleanora’s Falcon. 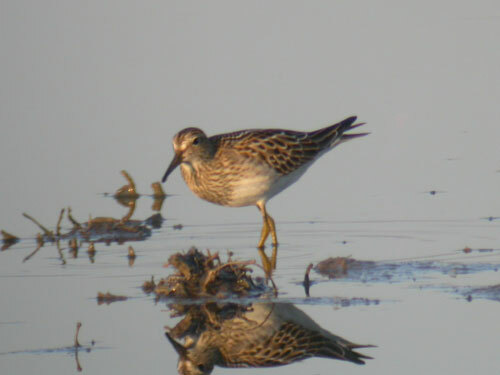 Rare species are generally found annually with the past few years producing Sociable Plover (late Feb), Pectoral Sandpiper (September), Marsh Sandpiper (August/September), Black Stork (August/September), Caspian Tern (October), Great Spotted Cuckoo (February), Red throated Pipit (May) & Snow Bunting (November). 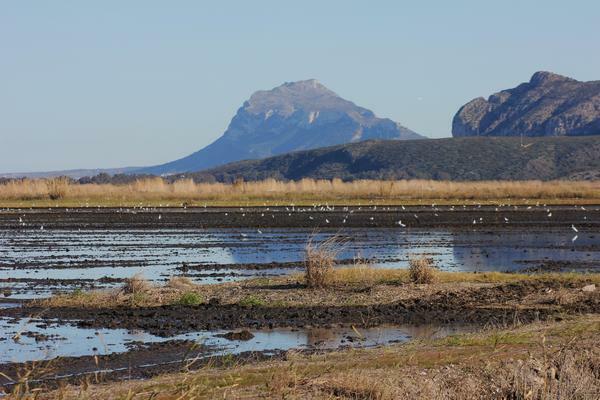 There are not only birds to be found at Pego Marsh with a chance of seeing Wild Boar in winter, and when it warms snakes can be found such as Grass Snake, Viperine, and possibly Horseshoe Whipsnake. A late Summer evening visit can also be memorable for the 1000’s of bats that hunt insect over the reeds. Take the N332 north towards Oliva & Valencia using the new Ondara by-pass. 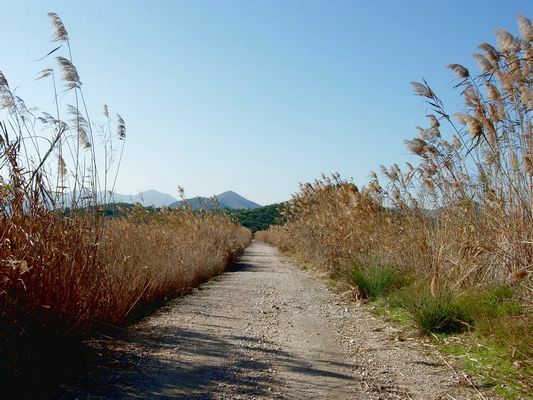 After ‘Casa Clara’ restaurant you take the next left hand turn – CV 678 to Pego. You are now heading inland firstly over the motorway and the marsh starts here. This road takes you between some tall reedbeds, after about 500m it opens out into flooded rice fields for another 500m.